Join Lily on her epic quest for the ultimate treasures, fame, and glory! Almost a lifetime ago, Lily´s grandfather was a famous archeologist. Since he was a young boy, he was digging for hidden gems around the world. Lily follows her grandfather’s footsteps as a young archeologist. Her epic quest for the ultimate treasure, fame and glory begins in a small town, below the garden of their own house. 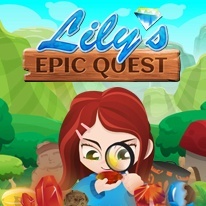 “Lily´s Epic Quest” is an innovative enhancement to the match-3 genre. Next to known match-3 mechanics, you clear a path for Lily through different ground layers. Removing blocks will make space for Lily´s path towards the center of the earth. Explore eight magical worlds on your search for rare gems and artifacts and find over 200 collectables. - Match 3 with free roaming playfield!